We’d love your help. Let us know what’s wrong with this preview of The Most Good You Can Do by Peter Singer. Peter Singer’s books and ideas have been disturbing our complacency ever since the appearance of Animal Liberation. Now he directs our attention to a challenging new movement in which his own ideas have played a crucial role: effective altruism. Effective altruism is built upon the simple but profoundly unsettling idea that living a fully ethical life involves doing the "most good you can do." Such a life requires a rigorously unsentimental view of charitable giving: to be a worthy recipient of our support, an organization must be able to demonstrate that it will do more good with our money or our time than other options open to us. Singer introduces us to an array of remarkable people who are restructuring their lives in accordance with these ideas, and shows how, paradoxically, living altruistically often leads to greater personal fulfillment than living for oneself. Doing the Most Good develops the challenges Singer has made, in the New York Times and Washington Post, to those who donate to the arts, and to charities focused on helping our fellow citizens, rather than those for whom we can do the most good. Effective altruists are extending our knowledge of the possibilities of living less selfishly, and of allowing reason, rather than emotion, to determine how we live. Doing the Most Good offers new hope for our ability to tackle the world’s most pressing problems. To ask other readers questions about The Most Good You Can Do, please sign up. WOOHOO! I sure hope he’s right! Peter Singer, an Aussie (!) is a renowned philosopher, Princeton professor, and author of many books, including the famous Animal Liberation in 1975. But you don’t have to be a scholar to enjoy his writings on ethics. The only reason I add a review is that I hope it might encourage people to donate so it counts. This is easy reading with plenty of anecdotes about people I’d call extreme donors (kidney, life savings), but he’s not too rough on those of us who set our sights a little lower and aren’t even vegetarians. ‘Effective altruism’ is getting the most bang for your charity buck - the most good for the most people (and animals). Some might be for immediate effective health or poverty relief, some might be for ongoing improvement of long-range conditions, like saving the planet. Singer discusses how the ‘bang’ is measured and audited - the real result of your donation. It’s not as simple as which charity spends the least on administration costs. For example, consider corporate lobbyists. Lobbyists don’t work in clients’ businesses – they attract customers and contracts. Charities might spend ‘admin’ money lobbying governments to create fairer conditions for entire communities of disadvantaged farmers. Singer discusses everything from mosquito nets and sanitation to climate change and NASA’s Near Earth Object Program, which is designed to deflect or obliterate asteroids and such that might destroy the planet. He talks about existential threats (our very existence is threatened) and what we can do to minimise the risks. Plenty of footnotes and a good index for reference. The upshot is, go to givewell.org and have a look at the results of their extensive research and become an effective altruist with whatever you’ve got to spare. What a weird book. "Effective altruism" sounded very interesting since it's true that tremendous resources are wasted on things that are known to be useless or harmful. This book is only vaguely about that. It functions OK as a discussion-starter on philosophical issues but I think it flops as a practical introduction to "the most good you can do." There is some good information on that but way too much of the book is devoted to dangerously irrelevant BS. Singer starts with, and repeatedly brings What a weird book. "Effective altruism" sounded very interesting since it's true that tremendous resources are wasted on things that are known to be useless or harmful. This book is only vaguely about that. It functions OK as a discussion-starter on philosophical issues but I think it flops as a practical introduction to "the most good you can do." There is some good information on that but way too much of the book is devoted to dangerously irrelevant BS. Singer starts with, and repeatedly brings up, the concept that you should abandon whatever you really want to do and go work for a hedge fund so you can make a lot of money and then give it away to charities he recommends. If you disagree with him on this, then you are against capitalism and all the progress in the world. And then he brings up Warren Buffett and his friends giving away their fortunes. This is goofy on so many levels that it's hard to know where to start. 1st of all, Warren Buffett has made statements to the effect that the Wall Street investment advising industry contributes nothing to the economy. It's a brain drain for our best and brightest to go to Wall Street instead of doing anything productive. Secondly, The Gates Foundation, which is where Buffett's money is going, is a pretty lousy example of effective philanthropy, since their efforts in education, for example, have been spectacular failures. In global health, the proven-effective things that Singer recommends, like bed nets, are specifically what the Gates Foundation spent years NOT focusing on, instead favoring moonshots like a malaria vaccine. 3. Even Donald Trump (!) has gone after the "hedge fund guys" because they don't pay their fair share of taxes, effectively taking money away from everyone else. How is that ethical or altruistic? 4. Beyond a couple of anecdotes, where is the evidence that Singer's career advice yields net good? The whole point of "effectiveness" is to do what has been proven to work, not what feels good or seems like a frightfully clever idea. 5. etc. etc. etc. The main gist: not all opportunities for charitable giving are created equal. We should be donating to the causes and organizations that do the most good. How does one evaluate "the most good?" Cost-Benefit Analysis, of course. For example, does it make more sense to spend $40,000 training a seeing-eye dog to help one blind person, or should we spend the money on operations that restore sight to the blind and cost $100-450 each? It's kind of a no-brainer, isn't it? The book begins by A quick read. The book begins by chronicling the life experiences of several "effective altruists," or people who think rationally about how they use their time and resources to help other people. It's anecdotal, but it makes you think: could I live on a fraction of my current income to have more to help the poor? The book, at times, reads like an advert for GiveWell. The author spares them all criticism, although he doesn't extend the same treatment to all the book's subjects. At times thought-provoking, this book was surprisingly light on philosophy for a book from a philosopher, particularly early on. Singer's strategy seemed to be to use anecdotes to convince readers of the value of empirically driven giving, which was a bit ironic. The book does pick up intellectually in later chapters, with more philosophical justification for effective altruism. I have two criticisms (of the book). One, I'm not convinced by the structure. Some of the chapters seem misordered to me. Also I picked this latest of Singer's books to read in my Ethics class for the utilitarianism requirement of the university's curriculum. The book has worked at generating interesting conversation among the students. Ah, Peter Singer. The ethic philosopher who's system is based purely on logic and reason. Emotion is usually the most important factor when it comes to ethics, but not for Singer and I think that's a good thing. This book is a nice quick read on effective altruism, which is basically: heavy suffering is bad, we can do something about it, therefore we should do something about it. In fact, we should do a a lot about it. But, in doing so, we should not be guided by personal opinion, we should striv Ah, Peter Singer. The ethic philosopher who's system is based purely on logic and reason. Emotion is usually the most important factor when it comes to ethics, but not for Singer and I think that's a good thing. This book is a nice quick read on effective altruism, which is basically: heavy suffering is bad, we can do something about it, therefore we should do something about it. In fact, we should do a a lot about it. But, in doing so, we should not be guided by personal opinion, we should strive to do the most good we can do. For instance, guide dogs cost a lot of money. For the same amount of money that it would cost to provide one guide dog for one person, it is possible to cure 2000 (!) people in developing countries from blindness caused by disease. Obviously, doing the latter is more effective and therefore, the more ethical choice. I will change the way I donate based on what I’ve learned from this book. It is a thoughtful, rational approach to making charitable donations. It was eye-opening in many ways (things like percent of funds spent on the charitable activity itself is not a marker of effectiveness; how donors of small amounts are less likely to be repeat donors when they have evidence that shows a charity is effective; and how very small amounts of money can save many lives when donated to the right places). The di I will change the way I donate based on what I’ve learned from this book. It is a thoughtful, rational approach to making charitable donations. It was eye-opening in many ways (things like percent of funds spent on the charitable activity itself is not a marker of effectiveness; how donors of small amounts are less likely to be repeat donors when they have evidence that shows a charity is effective; and how very small amounts of money can save many lives when donated to the right places). The discussions of whether emotional empathy actually increases charitable donations and whether altruism necessarily involves sacrifice were also informative. Still, I found some of the philosophical arguments unconvincing and even distracting. I applaud the application of rational thinking to this field, but the irrational aspects of human behavior must be better included. Efektif ya da etkili hayırsever kavramını hayatıma sokan bir kitap oldu. Bildiğimiz hayırseverlerden farklı olarak efektif hayırsever, ekonomik olarak ortalama yaşamı tutturup sonrasında tüm kazancını STK'lar aracılığıyla hayır işlerine harcayan kişi. Lakin bu kişilerin iki önemli özelliği daha var: daha fazla kazanmak ve böylece daha çok parayı hayır işlerine aktarmak için uğraşmak ve parayı bağışlayacağı STK'yı çok bilinçli bir şekilde seçmek. İstatistik ve matematik bu kişilerin rasyonel kara Efektif ya da etkili hayırsever kavramını hayatıma sokan bir kitap oldu. Bildiğimiz hayırseverlerden farklı olarak efektif hayırsever, ekonomik olarak ortalama yaşamı tutturup sonrasında tüm kazancını STK'lar aracılığıyla hayır işlerine harcayan kişi. Lakin bu kişilerin iki önemli özelliği daha var: daha fazla kazanmak ve böylece daha çok parayı hayır işlerine aktarmak için uğraşmak ve parayı bağışlayacağı STK'yı çok bilinçli bir şekilde seçmek. İstatistik ve matematik bu kişilerin rasyonel kararlar almak için başvurdukları araçlar. 25000 dolar gibi bir yıllık net gelir kişiyi dünyanın en müreffeh %4'lük kesimi arasına sokuyor. Böyle bir durumda efektif hayırsever kazancını maksimize etmek için uğraşıyor ama kendisi sürekli 25000 dolar düzeyinde yaşıyor. Hayatı kendisine zehretmeden, gayet mutlu, istediklerini yaparak... Çünkü bu insanlar zaten hayatta kişiye neyin mutluluk vereceğini, belirli bir düzeyin üzerindeki kazancın getireceği ekstra mutluluğun başkalarını mutlu ederek sağlanacak mutluluktan daha fazla olamayacağını idrak etmiş kişiler. Eylemlerini de gayet egoistçe buluyorlar ve bu şekilde daha mutlu oldukları için bu yolu tercih ettiklerini belirtiyorlar. Mülkiyeti ve kapitalizmi savunan pek çok öğreti, kişinin kendi menfaatini maksimize etmesine imkân vermeyen sistemlerin bireyi tembelliğe toplumu da bir bütün olarak geri kalmışlığa iteceğini savunur; epey de haklıdırlar bu görüşlerinde. Ancak efektif hayırseverler, kişinin standart bir medeni yaşam düzeyi içinde bulunduğunda hâlâ çok daha fazlasını kazanmaya motive olabildiğini ve bunu sadece başkalarına (hiç tanımadıkları insanlara, canlılara vb.) fayda sağlamak adına yapabildiklerini göstererek ezber bozan kişiler. Singer, efektif hayırseverin eğer finans sektöründe yılda milyon dolar kazanması mümkünse gidip bir STK'da bedava yöneticilik yapmaktansa bunu yapmayı tercih ettiğini ve bu kararı da basit bir matematik hesap sonucu rasyonel olarak aldığını belirtiyor. Mantık şu özetle: Benden sonra bu STK'yı yönetebilecek ikinci en iyi adayla benim aramdaki fark ne kadar? Çok değil! Peki, finans sektöründe yöneticilik yapacak benden sonraki en iyi ikinci adayın efektif hayırsever olma ve kazancının çok büyük bir bölümünü hayır işlerine adama olasılığı nedir? Çok düşük! O zaman git finans yöneticisi ol! Elbette burada rakamlara da çok takılmamak lazım... Temel mantık, eğer ekonomik olarak belirli bir seviyeyi tutturduysan yıllık gelirinin en az %10'unu hayır işlerine harca ve parayı bağışlayacağın STK'yı da bir araştırma yaparak ve matematiği kullanarak seç şeklinde özetlenebilir. Sonra bu %10'u artırmaya çalış. %30 son derece mükemmel bir oran bu arada kitaba göre. Bu konulara meraklı herkese şiddetle öneririm. İleri sürdüğü her fikre katıldığımdan ya da eleştiriye açık taraflar olmadığından değil, insanı bu konularda düşünmeye sevk eden, zihin açan bir kitap olması nedeniyle. This was a very positive and engaging read that made me consider how to do more in my life for the betterment of the world. This book's title (and message) is not entirely clear until you read it. The book is not about simply doing the most good that You-the-Reader can do, although I am sure it is a play on words, but is about "what" one chooses to do, as rated by effectiveness. Singer describes a group of people who have chosen to be called "effective altruists" and breaks this down: the defini This was a very positive and engaging read that made me consider how to do more in my life for the betterment of the world. This book's title (and message) is not entirely clear until you read it. The book is not about simply doing the most good that You-the-Reader can do, although I am sure it is a play on words, but is about "what" one chooses to do, as rated by effectiveness. Singer describes a group of people who have chosen to be called "effective altruists" and breaks this down: the definition, history, goals, motives and real world examples for such a group. He also walks the reader through some theoretical exercises for assigning value to various actions for the purpose of comparason, but is careful to disclose the complexity of many factors involved. The reader is left to make conclusions on their own, but is given a lot to think about. For personality types such as mine (INTJ Meyers Briggs) showing me a framework for this type of reasonable decision making regarding giving is truly exciting. It engages my desire to give, and to give to actually make the most difference for others. Một lần tình cờ đọc 1 bài viết trên mạng có phỏng vấn tác giả của cuốn "Bức xúc không làm ta vô can" thì thấy bác Giang có giới thiệu cuốn sách này, về chủ đề từ thiện, cụ thể hơn là làm tự thiện có hiệu quả. Đây cũng là một chủ đề mới mà mình khá quan tâm trong khi kiếm sách thì ko biết cuốn nào cả. Cuốn sách có ích cho những cá nhân cũng như tổ chức muốn tìm hiểu về việc làm từ thiện. Tuy vậy, khúc cuối có nói hơi chung chung và rộng, nên đọc hơi đuối đoạn này. While in agreement with most of the ideas I did not fully enjoy this book. I had read "The life you can save" still by Peter Singer just months before and I find most of this book covers the same topics and does not evolve the position much. Even some examples are the same presented in "the life you can save" which I enjoyed a lot more. Even when the book goes into the philosophical points in favor of effective altruism, the same points look more convincing in the previous books, since there, Pete While in agreement with most of the ideas I did not fully enjoy this book. Even when the book goes into the philosophical points in favor of effective altruism, the same points look more convincing in the previous books, since there, Peter Singer was always addressing counter arguments in a much deeper way. This does not happen in this book unfortunately. I am specifically disappointed by the last part which is supposed to provide a guide in choosing causes and organization and fails in addressing some important areas that are in general not covered by the charities mentioned, like "what is the most effective way to cope with sudden humanitarian crises". Wow this book made me think. My conclusion is that I'm a convert. Singer sets out in academic and accessible language the utilitarian arguments for "effective altruism". Convincing I so many ways and thought provoking in the same vein as his 'Justice' course. Incredibly useful for argumentation on rational arguments for altruism - as opposed to the traditional emotional views - this is well researched, clear, and concise. Referencing was very useful in following up on how a reader like me may pr Wow this book made me think. My conclusion is that I'm a convert. Singer sets out in academic and accessible language the utilitarian arguments for "effective altruism". Convincing I so many ways and thought provoking in the same vein as his 'Justice' course. Incredibly useful for argumentation on rational arguments for altruism - as opposed to the traditional emotional views - this is well researched, clear, and concise. Referencing was very useful in following up on how a reader like me may proceed. Still don't think there is enough value placed on the intrinsic value of art and culture, but this was/is my only criticism of Singer. Over the past three decades, Peter Singer has been continuously jolting us out of our reverie by goading us to think about some of the most pressing issues plaguing humanity. He takes this entrenched habit of his a notch higher with his new book "The Most Good You Can Do". Deliberately provocative and dilemma inducing, this book provides a rousing flavor of what it means to lead a life characterized by 'effective altruism'. Himself, one of the founding fathers of this moralistic concept, Singer d Over the past three decades, Peter Singer has been continuously jolting us out of our reverie by goading us to think about some of the most pressing issues plaguing humanity. He takes this entrenched habit of his a notch higher with his new book "The Most Good You Can Do". Deliberately provocative and dilemma inducing, this book provides a rousing flavor of what it means to lead a life characterized by 'effective altruism'. Himself, one of the founding fathers of this moralistic concept, Singer dwells on how best a life can be led in the service of other sentient beings, the beings here encompassing both human as well as non-human life. Singer takes great pains to enunciate the fact that effective altruism goes way beyond the customary donation to a random charitable organization that espouses the furtherance of a genuine cause. An effective altruist is one who reasons in favour of the maximum good being done to most persons who are in need of such generosity as opposed to enriching the physical and spiritual prospects of just one individual who is also equally in need of such magnanimity. But the moral compass which Singer deems a pre requisite for being an effective altruist is not something that people would view as not just being controversial but also as something that is enveloped in a cloak of serious subjectivity. For eg. Is spending $10,000 on an initiative to eradicate the ill effects of malaria in a poor and developing nation a more worthy and noble cause than donating the same amount to Make a Wish Foundation to enable the Foundation to fulfill a wish of a 10 year old afflicted with leukemia? Or is the act of voluntarily donating a kidney much more weightier in substance than making an annual donation to an organisation that has as its motive reducing the prevalence of starvation across a particular Geography? The book also cites a plethora of examples of 'effective altruists' who have taken a pledge to donate a significant and substantial portion of their income/earnings (some as high as 80%) to altruistic purposes and choosing to lead an austere life. To be scathingly honest some of the illustrations read more like a spurring propaganda for evangelism rather than an exhortation to make lives more meaningful. Bombarding a potential donor with a barrage of examples where people have sacrificed a life of luxury to live in piety, with a view to attracting a material contribution, might in fact have an exactly opposite and counter intuitive effect. The potential donor might be put off with what she thinks to be an extremely exacting challenge which is totally disproportionate to the objective proposed to be achieved. The book also contains the usual Singer offerings of Animal Welfare and charities devoting their time effort and energy towards the prevention of cruelty to animals. Singer also provides details about organisations such as Give Well which evaluate the work and worth of charities with a view to assisting aspiring donors in making a prudent and wise choice as to the charities to which they can donate their resources. It is certainly nice to read a book by a real philosopher that is written in a clear and totally comprehensible style, but that puts forth serious and thought-provoking ideas. I found that Singer regularly anticipated my objections to his arguments and shot them down one by one. If you want to do good, why wouldn't you want to do the most good possible, and therefore isn't it logical to earn the most money that you can while living modestly so that you can give it to people who are in the best p It is certainly nice to read a book by a real philosopher that is written in a clear and totally comprehensible style, but that puts forth serious and thought-provoking ideas. I found that Singer regularly anticipated my objections to his arguments and shot them down one by one. If you want to do good, why wouldn't you want to do the most good possible, and therefore isn't it logical to earn the most money that you can while living modestly so that you can give it to people who are in the best position to alleviate human suffering. I think that if I were a billionaire looking to give away half my fortune, these theories would make a lot of sense, but I'm not, and the effect of reading this book was just to make me feel vaguely uncomfortable, rather than inspiring me to become an "effective altruist." Doing good is inherently personal. I'd rather be Paul Farmer and find a way to contribute to saving thousands through personal hands-on interaction, than to be a Wall St. banker who saves tens of thousands by living in a garret while giving away 95% of his earnings to a deworming charity as Singer advocates. And I just can't buy Singer's dismissal of cultural charities and his complete indifference to spiritual ones. Maybe I am just a mean-spirited irrational troglodyte, but I don't think so. I think that it is more likely that despite the strength of some of his arguments, Singer is missing something fundamental about what it means to be a good person. I love reading Peter Singer’s books; he inspires me to be a better person. The Most Good You Can Do is about the concept of ‘effective altruism’; basically it’s about interrogating your own philanthropic choices to ascertain whether it’s money, time or other forms of altruism well spent. All of us are influenced to some extent by emotion when we give. There’s some rather dismaying research that shows that we are more likely to give to one child with a photo and a name than we are to photos of more I love reading Peter Singer’s books; he inspires me to be a better person. All of us are influenced to some extent by emotion when we give. There’s some rather dismaying research that shows that we are more likely to give to one child with a photo and a name than we are to photos of more than one child in need even when we know that we could save more lives for the same amount of money. We respond to cute and lovable, or tragic and sad, and we respond to personal appeals from someone we know. Too many of us give small amounts to lots of charities even though the cost of administering these small amounts often outweighs the donation. This is why charities pursue us for regular monthly deductions from our credit cards, because it’s the most cost-effective way of collecting the money and it’s money they can count on. From this book I learned that there are organisations such as Charity Navigator in the US and Give Well that exist to evaluate the effectiveness of the charity dollars we donate. But it’s not as simple as it looks: a charity with lower administrative costs may not be using some of its money to monitor due diligence or the effectiveness of what it does. There must be effective checks to ensure that the money is being spent properly, but research into effectiveness needs to take into account that some programs are long-term and others are short-term. Provision of clean water to schools (my favourite Oxfam Christmas gift) has an immediate impact on health outcomes (and school attendance) but adult literacy programs may take longer to take achieve results and the effects on community health or the local economy may be indirect and harder to trace. I already donate my 10% with Giving What We Can but I still found the information in this book really compelling and a great way of explaining a lot of the more controversial effective altruism arguments. People don't have to agree with everything that Peter says, only with the idea that we should all be using our lives to make the world a better place, and doing that in the best way we can, using reason, not just the heart alone. Also- love the NZ Aussie segment at the end, really helpful for a I already donate my 10% with Giving What We Can but I still found the information in this book really compelling and a great way of explaining a lot of the more controversial effective altruism arguments. People don't have to agree with everything that Peter says, only with the idea that we should all be using our lives to make the world a better place, and doing that in the best way we can, using reason, not just the heart alone. An interesting, thought-provoking and at times unsettling book - I don't agree with all of Singer's arguments or conclusions, but there're plenty of interesting ideas and excellent points made that I hope to remember and heed when making (hopefully sound, ethical) decisions and judgments in the future. As with so much of Singer's work, I have conflicting feelings about this one. On one hand, the idea of understanding the impact of lifestyle and philanthropy is incredibly important. We need to be better about evaluating the organizations we give to and looking at what the greatest needs in the world are. We also need to expand our beliefs about whose lives matter and work to make the world, as a whole, better for everyone. On the other hand, I'm not fully on-board with some of Singer's conclusi As with so much of Singer's work, I have conflicting feelings about this one. On one hand, the idea of understanding the impact of lifestyle and philanthropy is incredibly important. We need to be better about evaluating the organizations we give to and looking at what the greatest needs in the world are. We also need to expand our beliefs about whose lives matter and work to make the world, as a whole, better for everyone. On the other hand, I'm not fully on-board with some of Singer's conclusions. Being too committed to the "give by calculation of impact and need" metric can have problematic consequences. He brings up malaria quite a few times -- it's incredibly important to find ways to prevent the spread of malaria in developing countries, but it is also true that that is not the only issue and effort that deserves philanthropy. All these causes are part of an interconnected system, and other efforts that might seem less important than directly saving the lives of those threatened by malaria are equally important to human flourishing. Being too wedded to the "impact" metric has the potential to funnel money away from vital, though perhaps more fledgling, efforts. Then I thought Singer was conveniently not wedded to his metric-focused approach concerning two issues: birthing children and working for Wall Street. Maybe I'm super attuned to the value and importance of adoption, but in the discussion about the impact of bringing additional kids into the world, not once did he talk about the value of adopting as a way to build one's family. That is such an obvious oversight for a philosopher committed to living ethically towards the environment, and to one who believes all lives are equally valuable (wanting us to think beyond our in-groups). Secondly, he talks about the value of working in high-paying jobs, specifically on Wall Street, in order to give away even more money (aka, choosing that career over working directly for a nonprofit and being able to give less money overall but living out the effort in the day-to-day). Singer ignored the very real damage that institutions like Wall Street have on a large segment of the population, and ignored that potential impact of contributing to that unjust system. Those metrics are inherently more difficult to track than just "money given," and I didn't feel as though Singer took those metrics (nebulous as some of them may be) as seriously as he should have. Finally, I don't think Singer gave enough credence to the responsibility we have to serve and protect our own communities. Yes, we should consider the whole world our community, but we do have greater responsibilities to those with whom we interact on a day-to-day basis. That is part of our human nature, part of what makes life worth living, and I think we should take that proximity and mutuality very, very seriously as part of the whole way we live our lives. I wish Singer had taken that responsibility a little more seriously even while impressing upon his readers the need to value all humans as equally valuable, even those "out of sight, out of mind." I wanted to read this book to learn a little bit more about Effective Altruism. However, you can probably get away with just reading about it online for free. But then proceeds from the book go to charity, so reading it for free online wouldn't be effective.... Nonetheless, this is a well put together documents of all the ethical reasoning and concerns that surround effective altruism aka How You Can Most Effectively Save the World! Interestingly Peter Singer never addresses whether or not peopl I wanted to read this book to learn a little bit more about Effective Altruism. However, you can probably get away with just reading about it online for free. But then proceeds from the book go to charity, so reading it for free online wouldn't be effective.... Nonetheless, this is a well put together documents of all the ethical reasoning and concerns that surround effective altruism aka How You Can Most Effectively Save the World! Interestingly Peter Singer never addresses whether or not people are worth saving (if you want to take a Malthusian, nihilistic view of the world). I also found it interesting on further research the types of jobs one should take in order to be an effective altruist. To me at least there seems to be a lot of contradiction, but that it's OK because it's for a Good Cause. I don't think Peter Singer presents a fullproof argument, and a lot of his arguments are based on his point of view being correct in the first place. It seems more aimed at people who already want to do good, don't know how and need a blue print for how to live an ethical life. Atfer all my thinking on the topic I've almost come to the conclusion that really unless you earn a ridiculous amount, the only thing you should be giving away is your blood (truly something that you don't need, seeing as it automatically replaces itself). - We should most effectively give our money to charities that have the best 'returns', yet we shouldn't have factory farming despite it being the most efficient source of feeding, I dunno, 7 billion people and growing. - On that topic, if going vegan is so good for the environment (it is) then why are we saving people? Surely having more people on this Earth is bad for the environment. To be fair Peter does mention sterilising the planet at one stage, but it isn't given considerable thought. - Why push hedge fund managers, entrepreneurs and other high-flying careers on people, just because they are effective in that you earn more and can therefore give more? Interestingly there is no mention of emergency services as an altruistic career (or teachers) presumably because they don't earn enough. But also because the difference you can make is marginal over any other person who would get hired. Why is that a problem when, if you were offered a job as chemical engineer to make bioweapons you should take it because you will do marginally less harm? Is doing marginally less harm really that much more important than doing marginally more good? - Effective altruism to me means fixing the easy problems first. Consider your work day. You have a big report to do that is vital for a meeting with potential clients. But you put it off and do lots of tasks, like replying to emails, customer service, what have you. The report doesn't get done and the company loses the tender. Sure, you're moeny can fix the lives of many more people if you are treating malaia, worms and blindness, but something tells me these are momentary issues, almost feel-good charities as opposed to, I dunno, researching how to get off the planet, or even to reverse global warming? This is quite useful if you're struggling with finding meaning in your life and are curious about what you can do about it. If you really dislike John Stuart Mill, then this is *not* the book for you. The whole idea is built upon utilitarianism so, although I agree on many issues, I find it a bit hard to grasp all elements that Singer is talking about. The most useful information for myself is how we deceive ourselves into thinking that if we give 10$ to that charity and 10$ to the other we're he This is quite useful if you're struggling with finding meaning in your life and are curious about what you can do about it. If you really dislike John Stuart Mill, then this is *not* the book for you. The whole idea is built upon utilitarianism so, although I agree on many issues, I find it a bit hard to grasp all elements that Singer is talking about. The most useful information for myself is how we deceive ourselves into thinking that if we give 10$ to that charity and 10$ to the other we're helping two causes so yuppy for us. The point that Singer is trying to make is that not all charities are as efficient and that one should choose carefully which one to put their money into. Of course, he's advocating a lot for giving as much as one's income as possible to charity, stating that 10% is a rather low value. Yikes! It really sounds awesome in theory, but I honestly don't see this happening any time soon. We should first change many other values in our society before thinking of something like this. So I end up thinking "yes! I would absolutely love to do this!" but then the selfish gene takes over. I did some calculations and it turned out that I was giving to charity some 5% of my monthly base salary before I left my job. I actually thought pretty good about myself about it and considered it a fine amount to give away. Well, this book sure made me feel bad about it. Singer's world is idealistic and, as interesting as it is, I just don't think that our society will look like that any time soon. Not to mention that according to Singer I'm actually donating very inefficiently... As he mentions, donating to cure just one person, or to make a wish come true for a dying person, or donating for a friend's pet - all of this is emotional and it shouldn't happen because with the same amount of money you could cure maybe 100 people in developing countries. Well that sure sounds nice from a mathematical point of view, but are we really developed as a species to think like that? Regardless of what I feel about cancer in general, if someone I know will have cancer I will surely donate as much as my wallet & heart allow me to help them with treatment. Sure maybe this would have fixed 20 kids with malaria in Africa, but it's just how my heart works. I see charity as emotional, and not a brainy activity, and Singer does a pretty good job of making me understand that. And finally, and the point that I disagree with the most, he's encouraging people to work for highly paid jobs and donate a lot, as opposed to working in the non-profit sector itself. He says that non-profit workers are highly replaceable, while high paid donors are not. I don't have any data to back up my instinct, but I feel that he dismissed this too easily and I have a thought that if people's incentive to work in non-profit would be as high as working in the for-profits, then the non-profit would be more efficient too. But what he's saying does make sense, it's just that I suspect that he's also quite biased in that sense. The concept of effective altruism appeals to me a lot because it is like a turbo boost to The Secret P Effective altruism is the practice of donating money based on where it will do the most good in the world. Research shows that currently only a small amount of the world's charity is donated this way. Most people donate money based on emotional appeal (look at this photo of a sick child) or personal connection (their alma mater, a friend's fundraiser), and limited to their own locale or country. So, the more people that buy into effective altruism, the better. And it doesn't take a lot. It just means that whatever amount of money you normally donate to charity, try to donate it to the best places. There are organizations that rank charities (such as GiveWell http://www.givewell.org/) and can recommend the best ones. (Singer makes the good point that the frequent criteria "What % of your money is wasted on overhead?" is not as important as "Is our work actually effective?") And, if you don't already donate a good chunk of your income to charity, try to donate a little more. Because I can tell you, if you're reading this, there is definitely someone out there who needs it more than you. This book fell short of my expectations given that Peter Singer is a prominent advocate for effective altruism. The arguments are pretty superficial and backed by name-dropping oftentimes. I am told that his other book on the same topic, "The Life You Can Save" or another one by Will McAskill are both better choices. Though the book may not be able to change my giving habits, two important takeaways come to mind. First, even when we sincerely care and want to do good, most of us focus on the caus This book fell short of my expectations given that Peter Singer is a prominent advocate for effective altruism. The arguments are pretty superficial and backed by name-dropping oftentimes. I am told that his other book on the same topic, "The Life You Can Save" or another one by Will McAskill are both better choices. Though the book may not be able to change my giving habits, two important takeaways come to mind. First, even when we sincerely care and want to do good, most of us focus on the causes that we concern about and thus, do not consider alternative options to allocate more efficiently our contributions in terms of either money or effort. It may seem weird to use the terms "efficient" or "optimal" or "maximizing" because it makes giving to charity sounds much like an economic decision. Perhaps it is, after taken out all the emotional impact it has on us. We can't simply work on every single problem on earth at the same time given our resource constraints, and so it makes sense to priotize our focuses. If you agree that it is necessary to maximize the effect of our good deeds, then the natural question to ask is how to priotize the causes and/or how to quantify our impact. This part is where I felt the least convinced. If you know about the butterfly effect, you would understand that every single action by us creates a chain of reactions that we may be totally ignorant of. It seems like if you're good at math and coding, to be a data scientist and earn a lot of money gives you a tangible mean to give back every year. If instead, you choose to be a social activist, even after 10 years of hard work, you may mot see the direct impact on the issue that you'are campaigning. But who knows what lives you have touched on and how many minds you have changed? It just really really hard to quantify. 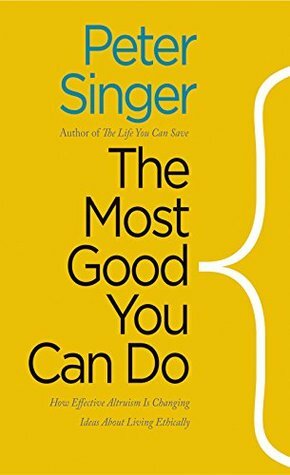 It is hard to disagree with the premise of this book, what Singer calls "effective altruism," that we should live our lives in whichever way will do the 'most good' for the world. However I do not believe it is always as easy to calculate the most good as Singer suggests. There are the obvious examples such as Barry Diller's recent $113 million donation to build a floating park for the affluent in downtown Manhattan is money that could have been used better elsewhere, but I do not agree that enc It is hard to disagree with the premise of this book, what Singer calls "effective altruism," that we should live our lives in whichever way will do the 'most good' for the world. However I do not believe it is always as easy to calculate the most good as Singer suggests. There are the obvious examples such as Barry Diller's recent $113 million donation to build a floating park for the affluent in downtown Manhattan is money that could have been used better elsewhere, but I do not agree that encouraging his students to make as much money as possible is doing the most good, as it ignores other potential variables. I would also challenge Singer's thesis that there is no inherent value in complexity (biodiversity), as I believe the health of the earth itself qualifies as 'good,' regardless of human experience. I want to start by saying that this is one of my favorite non-fiction books because it opened my eyes to a more global humanitarian outlook on life (a perspective that I have come to embrace 100% in my day to day life). "The Most Good You Can Do" showcases a very agreeable definition of effective altruism and explains the movement perfectly, whilst also showing the way this type of altruism can lead to - and these are my words not the authors- ethical capitalism. This book is great if you want I want to start by saying that this is one of my favorite non-fiction books because it opened my eyes to a more global humanitarian outlook on life (a perspective that I have come to embrace 100% in my day to day life). This book is great if you want to get into donating and don't know where to start or if you're already donating, but want to do it more efficiently. In part four there are concrete examples of organizations and communities to help you decide how you can and want to help globally. "The Most Good You Can Do" is a good resource for learning ways in which you can do good. It provides useful information on charities as well as metacharities to determine how donations can be most beneficial. It's an inspiring, informative read that I recommend to anyone wanting to do more good, and wondering how or where to begin. Singer's language is so accessible and clear that you almost forget you're reading philosophy. "If the world seems to be a more violent and dangerous place than ever "The Most Good You Can Do" is a good resource for learning ways in which you can do good. It provides useful information on charities as well as metacharities to determine how donations can be most beneficial. It's an inspiring, informative read that I recommend to anyone wanting to do more good, and wondering how or where to begin. Singer's language is so accessible and clear that you almost forget you're reading philosophy. An optional book for my grad ethics class, this book considers how altruism can be reimagined to be something pragmatic--donations of cash or (even) body organs to help the world become a better place. Singer is, as always, a daring thinker and makes one consider how far one might be willing to go to make the world a better place. I read an article about effective altruism and then checked 3 books on it out from the library. Charitable giving for nerds. Yep, that appeals to me. Halfway through the book I was reworking my budget and sending grants to the GiveWell top 3 charities. This is really valuable work that the community of effective altruists is doing and I am glad to have found Singer's book. He has served, on two occasions, as chair of phil Peter Albert David Singer is an Australian philosopher. He is the Ira W. DeCamp Professor of Bioethics at Princeton University, and laureate professor at the Centre for Applied Philosophy and Public Ethics (CAPPE), University of Melbourne. He specializes in applied ethics, approaching ethical issues from a secular preference utilitarian perspective.